Our First Customers at Super Car Guys South! 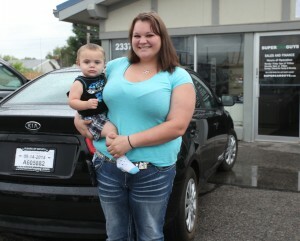 The entire Super Car Guys team would like to extend a warm congratulations and THANK YOU to Christina and Adam on their beautiful Kia Forte! They have the distinction of being our first car buyers at Super Car Guys South. Enjoy your nicer, newer vehicle! 1 comment(s) so far on Our First Customers at Super Car Guys South! Paul is the best! I bought my truck from him, and we will be returning to buy more in the future. Everyone was friendly and helpful. Paul did everything he could to get us the vehicle we wanted and for a price we could afford! Absolutely fantastic customer service! !